The Leeds Pottery Teasware selection has all the trappings of the Victorian era with its delicately twisted handled cups, mugs and jugs along with the choice of plain or pierced saucers. The delicate and fine teapots along with the chocolate kettle are truly magnificent. Morning coffee and afternoon tea (or low tea as it was sometimes referred to as) were generally brewed at the table using water that was kept hot and individually filtered into the cup, later the traditions of using a teapot or coffee pot were accepted. As both tea and coffee were considered luxurious commodities, partaking in a drink of either became a high class event and only the best teasware would be good enough to compliment these expensive drinks. It is thought the origin of afternoon tea started with the Duchess of Bedford in 1841 when she needed a drink and snack to tide her over until dinnertime which was often served quite late in those times. She quickly started the tradition of tea, cake (such as scones with jam and cream) and sandwiches (such as cucumber), to be served around mid afternoon. The British have never looked back and the drinking of tea has become part of our very culture. Interpretations of which have been spread across the world, some as a result of the spread of the British Empire. The Leeds Pottery products for tea and coffee ware are the very epitome of all that is best in pierced ware. These delicate items stand in their own right as beautiful pieces, as the intricate piercing adds not only to their appearance but to their desirability. Ever since the early tea and coffee houses were open crockery had to add to the occasion by enhancing the taste with pretty serving vessels. Both America and England began in the late l880's to offer tea in fine cafes and hotels and the tea service was quite the done thing in Tea Rooms and Tea Courts. Upper class Victorian ladies would meet with their gentlemen in the afternoon for late tea and conversation. Famous hotels like The Ritz and The Plaza were noted for their fine offering among other special services. Of course tea was not the only beverage to be offered to customers as coffee and chocolate were also served and much enjoyed. These traditions remain celebrated today, and whether you enjoy the full formal afternoon tea or just enjoy a lovely cuppa then look no further for your teasware requirements. Individual presentations can be achieved from Leeds Pottery Teasware by mixing the Chocolate Cup or Teacup with Plain or Pierced Saucer. In early times the teacup had no handle on it and tea was poured into the saucer and drunk directly from that hence the design of the deep plain saucer. Traditional and quirkily designed teapots are seen here along with the very pretty Pierced Teapot – your eyes may deceive you into thinking it is full of holes, but no don’t worry it has a liner! 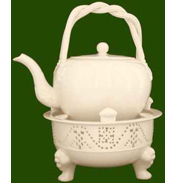 Another popular piece, particularly in America, is the No Stamp Act Teapot. This is reference to an act passed by British Parliament in 1765 that required all American colonists to pay tax on every piece of printed paper to help pay the costs of protecting the American frontiers. The principles behind this act caused uproar and led to the production of pieces such as this in direct opposition. Making this particular piece of noteworthy historic importance. Looking at other items available within Teasware, for the more discerning there is the Breakfast for Two or the Creamware Tea Service: Tea For Two pottery sets which have all the pieces you need to create a setting for two for both of these dining occasions. Make every drink of tea or coffee memorable and even historic with this wonderful range of Teasware from Leeds Pottery.